Glenn Quirion of Sweet Tooth Bakery uses dozens of eggs in batters. The “workingman’s special” at Mul’s Diner in South Boston includes three eggs, home fries, and toast. But lately, it has required some creative accounting to continue to offer the hearty breakfast at the workingman’s price of $4.95. A national shortage has sent the cost of eggs skyrocketing during the past month, leading managers to increase prices on other menu items, a nickel here, a dime there, to avoid raising the tab on the three-egg best seller. And it’s been no small task at the Southie diner, which fries, scrambles, and poaches more than 2,000 eggs each week. The price of eggs has doubled in just a few short weeks as an outbreak of bird flu in the Midwest has led to the euthanization of some 35 million egg-laying chickens, about 10 percent of laying hens nationally, and sharp drops in production at some the nation’s biggest poultry farms. Wholesale egg prices in the Northeast jumped as high a $2.55 a dozen at the end of last month, up from $1.24 in early May. 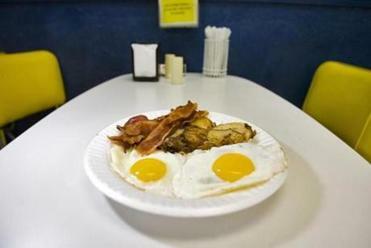 Be it scrambled, poached or sunny side up, the cost of egg breakfasts may jump by billions of dollars during the US’s worst outbreak of bird flu, Goldman Sachs Group Inc. said. At the retail level, some supermarkets are selling Grade A large eggs for as much or more than typically more expensive “cage free” or organic eggs, which sell from about $3.50 a dozen for cage-free to more than $5 for organic. The surge in egg prices has hit restaurants, bakeries, supermarkets, farm stands and consumers as they all scramble to offset increases and find new supplies. The American Bakers Association, a trade group in Washington, has declared a crisis and called on the Obama administration to allow increased imports of eggs and egg products. 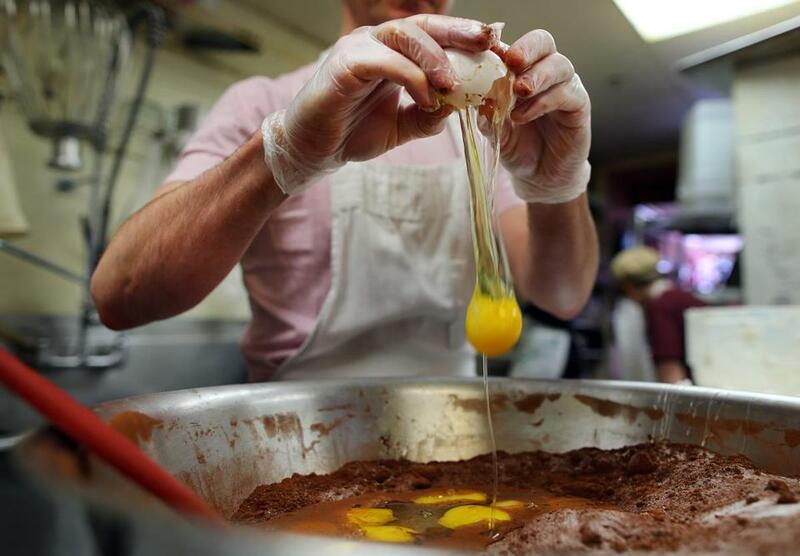 Ferhat Adli works in Mul’s Diner in Southie, which serves 4,000 eggs a week. Andrew Siegel, co-owner of When Pigs Fly Bakery in York, Maine, with shops in Boston, Brookline, and Somerville, said his weekly egg bill has jumped to $1,250 from about $600 a month ago. His bakery uses about 500 dozen eggs a week to make various types of breads, including a best-selling orange-cranberry loaf. Siegel said he won’t raise prices, but shrinking profit margins from the higher costs will leave him with less capital to buy equipment or expand his 22-year-old business. “Hopefully they figure out the situation before it gets worse,” he said. The US Department of Agriculture has identified more than 200 cases of avian influenza as the disease, carried by wild birds, has spread from California to the Midwest during the past 18 months. Short supplies and higher prices could persist for months — or longer, according Urner Barry. The commodities research firm forecasts that raising enough young chickens to maturity to replace the lost population could take from six months to two years. The faster the better, said Glenn Quirion, owner of Sweet Tooth Bakery in South Boston, who uses eggs in most of his creations, from custards to cookies to wedding cakes. He’s paying $80 for a case of about 350 eggs that several weeks ago cost about $35, he said. He’s unsure how many more weeks he can go without raising prices. Some national chains have already taken cost-cutting steps. Texas-based Whataburger temporarily pared back its breakfast hours in early June as a way to serve fewer eggs. In Pennsylvania, some prisons have begun rationing eggs. Rita Shuler, a Dorchester grandmother of 10 who was recently shopping at her neighborhood market, said she normally buys two dozen eggs a week, but has cut back to 18 because of price increases she called “ridiculous.” She said two dozen eggs cost about $7; a dozen and a half cost $5.19, up from about $3, she said. 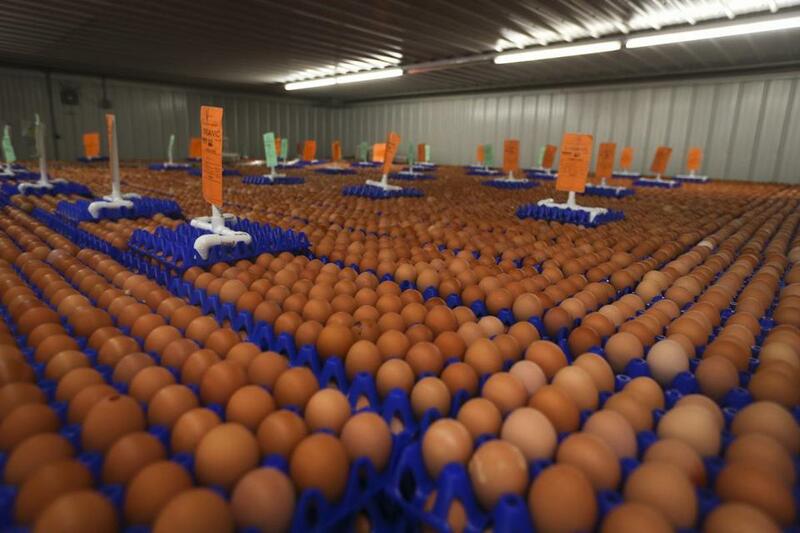 About 1 million eggs sat in cold storage at Pete and Gerry’s Organics, an egg distributor in Monroe, N.H., that gets eggs from 30 farms in the Northeast. Local organic egg producers, meanwhile, see an opportunity as their prices become more competitive with factory farms. Jesse Laflamme, owner of Pete and Gerry’s Organics LLC in Monroe, N.H., one of the region’s biggest organic egg distributors, said he gets eggs from more than 30 family farms in the Northeast, as opposed to giant Midwest poultry farms that cage as many as 500,000 hens in a single building. Laflamme said he hopes reports of the massive kill-off of birds has heightened awareness of the conditions that produce cheap eggs and will lead more customers to appreciate the more humane, natural, and careful, albeit more expensive, ways organic eggs are raised. Pete and Gerry’s large organic eggs retail at $4.79 to $5.29, LaFlamme said. At a Roche Brothers supermarket in Acton, conventional large eggs were recently selling for $3.89 to $4.59 per dozen. Megan Woolhouse can be reached at megan.woolhouse-@globe.com.